OK, so it’s not exactly a secret that the Android gaming market is saturated with clones and copies of all sorts. Some could even claim that the most popular games are nothing more than rehashing or even blatant theft of different ideas. However, from time to time things do appear that seem to be pushing the envelope to a point of breaking for its owners and developers. Right now, John on Fire seems like one of those games. The game is basically a mobile version of the John Wick franchise. It’s a top-down shooter that features John Mills. The same person is a former assassin that goes on a vengeful mission against the organization in which he belonged while he clocked the killing clock. Sounds familiar? Also, the subtitle is "A man's cat taken". Now, this is a bit telling. However, if you look at the design of the main character as well as the nature of the action, you see it's definitely playing on the John Wick card. 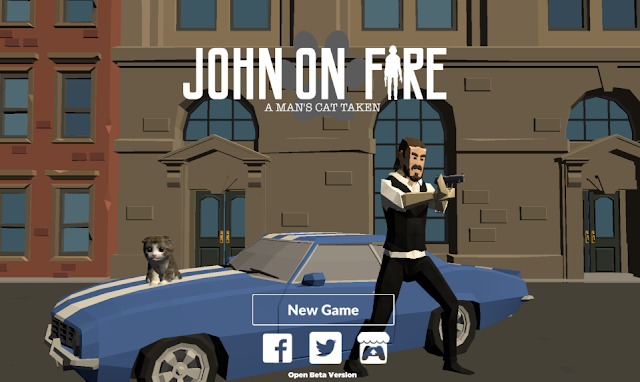 The game includes a low-poly graphics, but the outfit and even the facial features are all that of John (the more famous John who isn't on fire). The game was developed by XK Software Development and to make things worse, it doesn’t look that awful (not good either, but it's not a disaster). However, the use of the John Wick brand will likely stop it as soon as the Summit Entertainment gets it on its radar. Some of us just never learn.